CUSTOM:We can custom make dress for you in any size and color,just please contact your WEAR DATE and accurate measurements(BUST-WAIST-HIPS,HEIGHT, HOLLOW TO FLOOR, SHOES HEEL HEIGHT),ABOUT HOW TO MEASURE,please kindly refer to our pictures.Thank you. -Tailoring usually takes 3-7 days,by expeited shipping,it usually takes 2-4 days;by standard shipping,it usually takes 7-12 days. Material:Tulle. 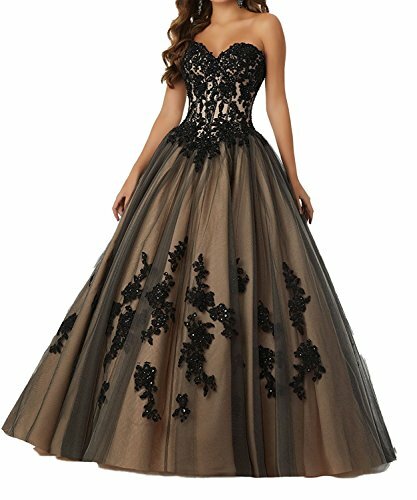 Beaded sweetheart princess quinceanera dresses 2018 long tulle prom party ball gowns. Strapless sweetheart/ Lace appliques and beaded/ Floor length/ Corset back. Suit for quinceanera/prom/party/ball/gala and other special occasions. To fit on you well, please kindly refer to OUR OWN SIZE CHART and Measuring Guide on the left and choose the right size for yourself. If you have any doubts about your size or color, please contact us freely. Custom:we can customize any size and color, if you need this service, please tell YOUR WEAR DATE and your correct measurements about BUST-WAIST-HIPS, HEIGHT, HOLLOW TO FLOOR, SHOES HEEL HEIGHT. Handle time 3-7 days,standard shipping 7-12 days,expeited shipping 2-4 days. If you need it urgently,please choose Expeited shipping and tell your WEAR DATE we will provide rush service.